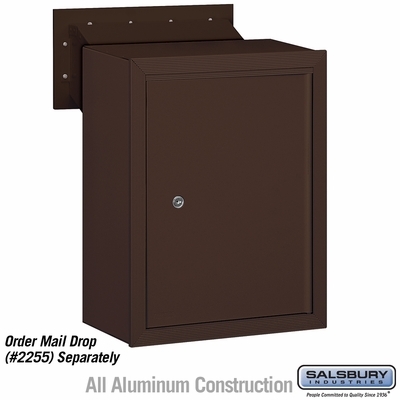 Private access mail drop option receptacle comes in attractive bronze. These private mail receptacles feature front access. Customization options are available. 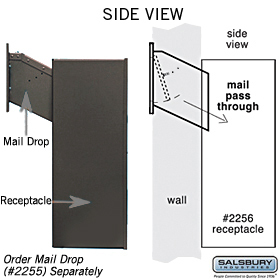 These mail receptacles align with Salsbury 2255 mail letter drops. High-quality construction makes Salsbury mail drops for private access a favorite choice among residential and commercial property owners and managers. Question: How thick is the wall where these could be mounted? Answer: The chute attached to the mail drop (item 2255) is 6". So no more than 6" in depth. Question: Is custom engraving an option for the Salsbury receptacle? Answer: Yes, custom engraving is available as an option. Thank you. Question: I have an existing mail slot for my door, and have been looking for a secure receptacle to discourage burglary. Would this work with a flush opening on the back of my door that is about 12x6"? Answer: Model #2256 Receptacle is designed to mount flush to a flat surface.